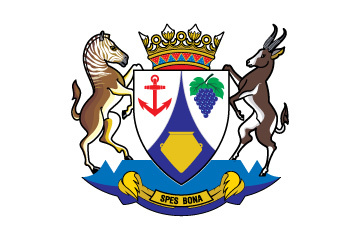 The new coat of arms for the Province of the Western Cape was approved and enacted by Provincial Parliament in 1998. (Act No 7 of 1998: Western Cape Provincial Coat of Arms Act, 1998). The coat of arms is the result of several months of research and consultation with important role-players (especially representatives of the political parties represented in the Provincial Parliament), and the dedication of everyone involved in the project. The design is the painstaking work of Fred Brownell, the State Herald of the Heraldry Council based in Pretoria, who assisted the Province in its quest. The elements encapsulated in the design were chosen because of their wide support and because they reflect the uniqueness of the Western Cape. The predominant colours, red and gold, have a long association with heraldry in the Province. An anchor - representing hope, stability, faith and the Province’s maritime history and marine riches. A bunch of grapes - refering to the importance of agriculture and more specifically the importance of the Western Cape as a wine-producing area. A clay pot as elements - symbolising manufacture and is also an artefact created by the Khoi, early inhabitants of the Province. the Bontebok (Damaliscus dorcas dorcas). The former, though at present extinct, is now the subject of a specialised breeding programme with the objective of producing a new population of this animal, while the latter was saved from the brink of extinction. Both animals are unique to the Province. The base on which the 2 supporters stand is in the form of a stylised representation of Table Mountain, the Western Cape’s most distinctive natural feature. A beaded headring (a form of ornamentation among the San). A protea flower, representing the unique fynbos of the Province. Rings, which are considered to be symbolic of perfection, having no beginning and no end. The coronet design can also be used on the head of the provincial mace. The motto is SPES BONA meaning “good hope” and is printed on a riband with the foldbacks in the form of 2 ostrich feathers, the latter being a well-known commodity of the Little Karoo. The new coat of arms serves to enhance the identity and dignity of the Western Cape.